My kindle purchase was a long time coming. I first wanted one back in the day when all you could do with them was read a book. As an avid reader this appealed to me greatly but the price put me off, over £100 back then for what was essentially a screen with writing. There were no bells, no whistles and I had many more urgent and interesting things to spend my money on. The kindle I ended up buying just last Christmas was the Kindle Fire HD 6inch screen. At £60 it really was a purchase for cheapness rather than anything else, but it has become my purchase of the century. I got it home and began the easy set up, all you need for this is an internet connection and an Amazon account, if you don’t have one thing Kindle will prompt you to make one, if you do then you can just sign straight in. 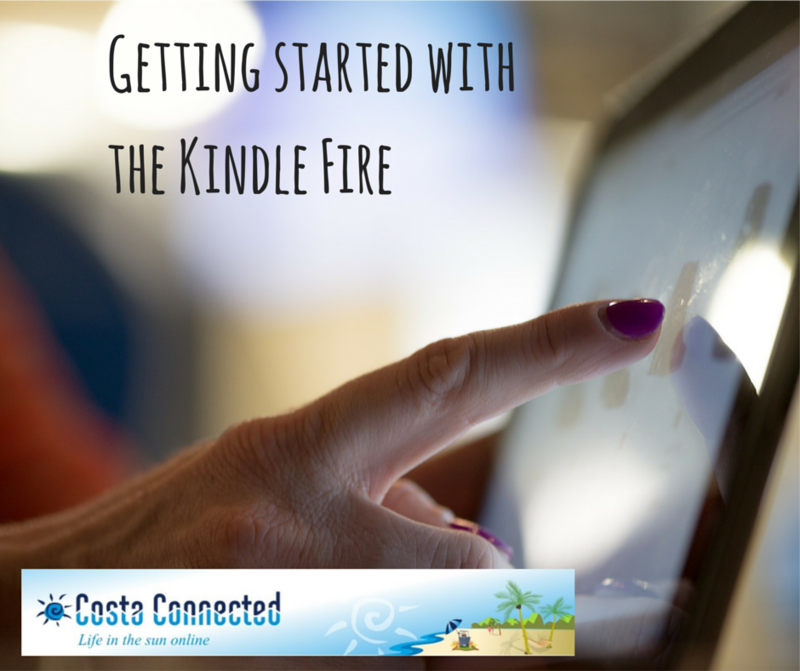 Once you have completed this your Kindle will set itself up, you really don’t have to touch it at this stage, apart from entering your wireless password – all the important apps such as the camera will already be loaded on to your kindle. Unfortunately instructions are not its strong point however and it mentions very little about settings and apps and how to navigate your Kindle after this. The preloaded apps include the clock, your contact list, camera, browser and other tool based apps. You will be prompted to set your clock when you first set up your Kindle, included in the clock is the alarm, to set this touch the clock and the time will appear. along with the option to set an alarm for weekends and/or weekdays. Once you have chosen which alarm to set, it will prompt you to set time, days needed and a sound to be woken too, you can click each sound to choose the right one, for me the gentler the alarm the better, the children have to be jolted awake. Your contacts can be set up using the sync method or set up manually and you choose to have them on your device only. Personally I favour the latter as syncing tends to put far too many people on my device I really don’t want there. Again the Kindle will prompt and guide you through step by step. The E-mail app is set up easily by just entering your email address, once set up it will take you directly to your inbox. Calendar is also set up and connected to your email if you are using an old hotmail or outlook address. The next app, the camera, is one of the simplest camera/video apps I have ever used. It is set automatically to camera when you click into it, but can be switched to video with a large red button. If you flip to video it automatically starts videoing until you press either the stop button or camera button to take you back to the camera. The video is saved to your Kindle automatically. Back in camera mode you can either take pictures in the normal way by pressing the shutter symbol or hit the rotate symbol in the top left to reverse the camera and take a selfie! The cog wheel symbol that holds a few basic settings and to zoom in or out you use the volume button located on the side of the kindle. In the bottom right of your camera/video screen is a small square picturing the most recent photo/video, clicking this will take you to your camera roll, where all the pictures or video you have taken are stored. You can edit, delete or share this using the appropriate buttons at the top of the screen. Please note if you have your rotation locked, the camera will not function correctly, you can change this by swiping down the screen and tapping the auto-rotate button in the top left corner. There are other settings in the swipe down screen, the main settings are under the cog wheel on the right, these control the whole of the Kindle and how it performs but they shouldn’t need to be adjusted unless you want to change the way your kindle runs or set up controls for a child. In the swipe down menu there is also a help symbol where you can find basic tips and advice for the Kindle, a brightness symbol so that you can adjust brightness quickly and a wireless symbol, so you can change your wireless settings if required. Finally, in the swipe down screen is the firefly, a service that is only available on a Fire HD and one I have used a lot. If you hit the firefly button you can then listen in on the TV, Video or Music and identify them with a tap on the screen. This comes in very handy when sat in a pub and that sing you love comes on, you know the one you think is great but you never knew who wrote or sung it? Well now firefly will come to your rescue and tell you in seconds. Hubby bought me the normal Kindle for my birthday 3 or so years ago. I loved it… best present ever!!! 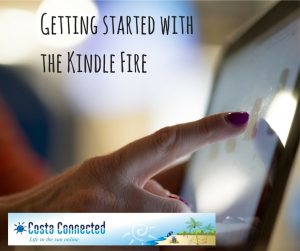 But within a few months I had seen a Kindle Fire – well of course I wanted one! They were still quite heavy back then though, so I was undecided. Now they are much lighter and blimmin awesome!! I still don’t have a Kindle Fire but recently my father in law presented me with a Galaxy tablet recently – oooh I love it!